India are favourites to retain the Champions Trophy on Sunday but they would probably have preferred to face different opponents than Pakistan in what is sure to be a highly-charged finasl. The neighbouring countries have moved on from years of political conflicts but emotions will run high as millions of supporters around the world watch the first major cricket final between the teams since the 2007 Twenty20 World Cup. Some estimates suggest Sunday's match between the sub-continental cricket giants at the Oval in south London could attract a worldwide television audience of more than a billion viewers. One of the most unpredictable sides in world sport, Pakistan were the lowest-ranked side going into the tournament and produced a shambolic performance in their heavy opening defeat by India. India suffered a shock loss to Sri Lanka in the group stage before overwhelming Bangladesh in the semis and their captain Virat Kohli has been impressed by Pakistan's resurgence. 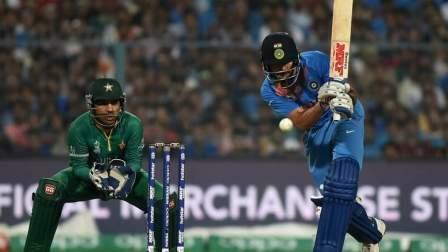 "The turnaround has been magnificent," Kohli said. "Obviously, if you reach the finals you have to play some good cricket and credit to them, they've turned around things for themselves really well. "The belief just showed on the field the way they played together as a team and regardless of who you play in the finals, it's always going to be challenging because once you start thinking that it's a big game, then your mindset changes." India, who beat Pakistan by five runs in the Twenty20 final 10 years ago, have been lifted by the outstanding batting form of Kohli, Shikhar Dhawan and Rohit Sharma. "What we are going to try to do is repeat the similar sort of cricket that we have played so far, knowing the strengths and weaknesses they have," Kohli said. "I don't think we need to look too far away from what we are doing as a group, focus on our skills and our abilities and believe in ourselves on that particular day." Pakistan, without their leading fast bowler Mohammad Amir due to injury, strangled the usually free-scoring England batsmen on a slow wicket in Cardiff with a disciplined display of bowling and fielding. The Oval pitch should be more favourable for batsmen but India, who have beaten Pakistan in eight of their 10 World Cup and Champions Trophy meetings, will not be complacent. "We've seen some really surprising results and it's been amazing for the fans to watch and for the players to be a part of," Kohli said. "We played some really good cricket but we're not going to take anything for granted for sure." Pakistan's rejuvenation has been built around the runs of opener Fakhar Zaman and the experienced Azhar Ali while Hasan Ali and Junaid Khan stepped up to compensate for the absence of Amir who is expected to be fit for the final. Their captain Sarfraz Ahmed said they had quickly forgotten the opening loss to India and simply focused on the next game in their bid to win the Champions Trophy for the first time. "After the India match, we just motivated the guys," he said. "Don't worry about the India match. This is gone. If we play good cricket, definitely we will win this tournament."